Calendar shows you your personal calendar, the school calendar, and—for faculty and students—course meeting times. In addition, if others have given you access to their personal calendars, or if you have access to room calendars, you can select to display those, too. Select from Day, Week, or Month views, navigate forward or backward, or jump to Today using the buttons at the top of the screen. Check or uncheck calendars in the left sidebar to display or hide them. Start typing the name of the calendar you want to see. If you have access to it, it will come up in the results; select it and click Add. 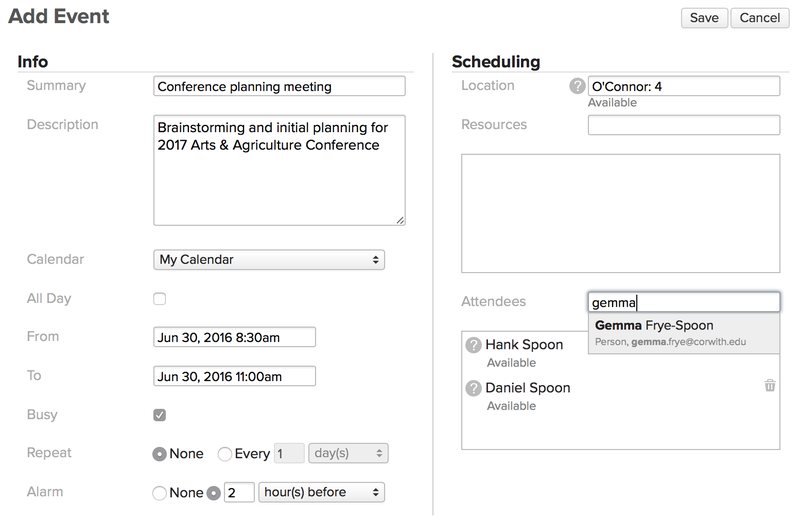 You can create new events for any calendar to which you have read/write access. Double-click the day, day/time, or time slot when the event will occur. You can also click Add Event in the left sidebar. Enter a summary and, if you like, a description. Choose which calendar this event should belong to. This selector always defaults to My Calendar. Check if the event will last all day. Enter the time period using the date-time fields. Check if you wish to be marked busy to others during this event. Do you want this event to repeat on a regular basis? Would you like to set an alarm for this event? If checked, we will send an obnoxious talking tropical bird to screech a reminder at you within a few minutes of the alarm you set. If no birds are available, we'll send you an email. You can set a location by typing a room name; if there's a schedule conflict, you'll need to choose another location. Invite people to attend your event. You can type names of Populi contacts or enter email addresses for people not in Populi. After creating the event, you'll see it in Calendar (Attendees will receive an invitation). Five days before the event, you'll see it Events on your Populi Home page. Delete an event by viewing it and clicking the Delete button. Deleted events are stored for two weeks in the Trash view, where you can click to restore it. Invitations displays your Incoming (you've been invited) and Outgoing (you've invited somebody) events with attendees. Choose the default view—Month, Day, or Week. Select roles—anyone with this role will be able to read and/or write to your calendar. List people (they must be Populi users) by typing their names and selecting from the results. Select their level of access—Read or Read/Write. Remove a person or role by clicking . Import events from other calendars by uploading a valid .ics file. It would be nice for an administrator to be able to upload to the "school calendar" in the iCal format and make it universally show up for each user. I created a separate Admin user and uploaded our college calendar to admin's My Calendar successfully, but now i have to notify each user to add that calendar and from what i can see it doesn't even show up on the home page with upcoming events since the events are not in My Calendar??? Currently, Populi doesn't do that. We're thinking about ways to accommodate this request, though. Thanks for your comments. This sort of thing helps me tune the articles to the needs of our users. Can an event be on My Calendar and School Calendar? I can't seem to include myself in the list of attendees. I thought this might put it on My Calendar. If the school has a holiday in the middle of the semester, is there a setting in the calendar that removes Attendance for those dates? We've talked about doing something like that, but more in terms of an Academic Term setting that would block out holidays and other breaks so that courses don't get meeting times set up during those periods. Can calendars be exported from Populi in the ical format as well as import? No, not at this time. I'm not aware of any plans to upgrade Populi Calendar in this way. Has Peace River looked into Google Apps for Education?